High Octane Fitter 52 supplement is formulated as a very high protein supplement to affect leanness. Designed to quickly promote muscle synthesis and definition, it’s proprietary ingredient blend and can be fed to all show livestock species. The amount fed per day depends upon the species, age, and weight of the animal (lighter or younger animals need less per day). Greatness on the inside, shows on the outside. 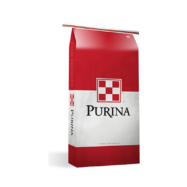 Let Purina Honor Show Chow give your show animals the edge needed to win.